At about the age of seven, the child makes a transition from the sensorial and the tangible to abstraction, for it is at this age that the need for abstraction and intellectualization arises. The child’s mind at this age no longer merely absorbs, it turns to exploring and the adults’ task at this time is to offer the child a comprehensive view of the world. The Montessori pedagogy gives children time to stop and consider the world in all its aspects. Thus, an understanding of geography, for instance, requires that it be presented in the context of the history of the Universe, the formation of the planet Earth, the appearance of human beings on Earth, and also in conjunction with geology, physics, chemistry, etc. In a Montessori environment, the child at this age becomes a true explorer, with a passionate interest in the world which surrounds him and of which he is a product. 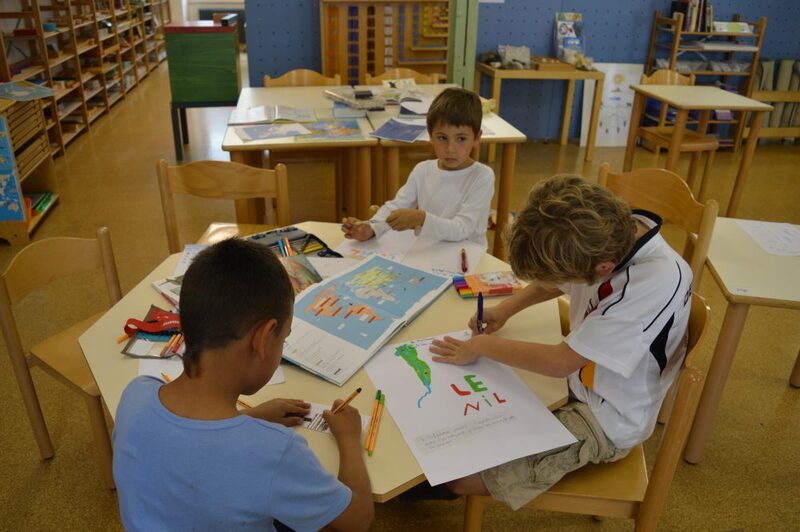 At this stage, the child prefers to work in a group rather than working alone ; he develops his own way of working and of interacting with others. The child’s investigating mind leads him to ask questions. It is no longer enough for him to register facts, he wants to understand their causes, he is interested in finding out the “how” and “why” of things and of events. He becomes aware of the existence of cause and effect. It is at about the age of seven that the first signs of interest in moral issues appear, the judgement of actions. This concern proceeds from a very special inner sense, an entirely natural feature : the conscience. And also at this age the child awakens to the notion of justice, as he begins to understand the relationship between his actions and the needs of others.